Allow me to introduce you to one of the most luxurious skin care brands i've ever experienced in both appearance and ingredients. Even after the first application, I knew there was something impressive about these products. The pricing appears high but after reading up on the ingredients, the science behind the brand and using them, i'd definitely recommend trying them if you're able to. I would have reviewed these sooner but they so quickly became a morning and night ritual for me that it slipped my mind i hadn't already shared them with you. This, combined with the Beauty Elixir were the first Kypris items I tried. It contains 26 active natural ingredients including LOTS of antioxidants; Sea Algae to hydrate without blocking pores, Rose Extracts to soothe and tone, Tamanu for healing and cell renewal and many others. Read a little more about it and the science behind it here. The antioxidant dew is a white serum that sunk into my skin fast and left it feeling plump, healthy and looking glowy without any residue. It has an extremely light, herby scent that dissipates quickly. I apply this in the morning only. It made for a great base under makeup and didn't interfere with any products i used over it but actually helped when it came to blending out my Anastasia foundation over the top of it (typically a fairly dry product). I'd say the product description of "Quench and Glow" is pretty damn accurate and even as someone with oily/ combo skin, the hydration it gave me was perfect and as mentioned, left no residue or oily look to the skin, just a plump, hydrated glow. Because of this, i'd say it would be suitable for most skin types but if you have a lot of breakouts, you might consider the Clearing Serum instead. All in all, a great daytime serum/moisturizer either used by itself or layered underneath the Beauty Elixir for a little extra hydration (i recommend mixing the two and trying them as a combo if you're able to). When i heard this was an alternative to retinol products, i knew i needed to try it. This utilizes fermented pumpkin enzymes to soften and exfoliate the skin and i definitely noticed my skin feels incredibly soft, smooth and plump the morning after using this without any irritation that comes with traditional retinol. Again, you can read more about how it works here. This one contains 18 active natural ingredients including the Pumpkin Enzymes i mentioned; Epidermal Growth Factor which is a plumping and renewing peptide, Sea Algae again to calm and hydrate, Xylitylglucoside which is a precursor to my favorite: Hyaluronic Acid as well as Neroli to soothe skin and encourage sleep. The consistency is more like a gel and absorbs into the skin quickly with a slight cooling effect (or is this just me?). The scent is slightly more noticeable than the Antioxidant Dew and i think it may be the Neroli giving it its scent but as with the other serum, it does dissipate quickly. This one is only to be applied at night time. If you have issues with breakouts, texture, fine lines or just dull looking skin, i really think you will love this product. It gave me similar results to retinol but without any of the flaking or adjustment period that usually comes along with them. 1000 Roses Beauty Elixir was, i think the first product i came across when i heard of Kypris and i must admit, the price tag made me gasp. The Beauty Elixirs are very concentrated products that you need to use VERY little of... although, i will say you'll be tempted to use more after trying it so be sure and keep it to just 2 or 3 drops as thats plenty. Beauty Elixir 1 is intended for dry skin and i believe is the most moisturizing option. It contains Bulgarian Rose to combat acne and soften skin, CoQ10 to diminish any sun damage, Vitamins C and E to boost collagen and many more you can read about here. To apply this i either mix with one of the above serums or apply over the top. I've also applied just half a drop to any dermatitis patches and have found it to be very soothing and have great effects on it. Although this is an oil, it doesn't leave and residue on the skin and is really easily absorbed and seems to quench any dry patches in a long-lasting way. Another great one under makeup and can be used morning and night. So definitely a pricey product but it is, without doubt, the best facial oil i've used. 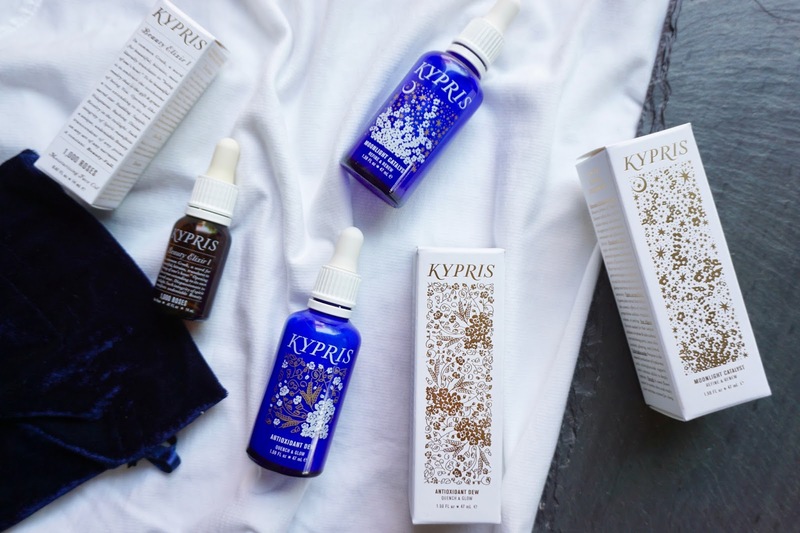 As a brand over all, i adore what Kypris stands for, not only for their holistic, high-performance products but i love that their ingredients are sustainably grown and each product suggests that you "kindly offer yourself honest compliments" as you apply. Just beautiful. Do let me know if you'd like to see these or any other Kypris products reviewed and demo'd on my channel and if you have any other questions, do leave them below. Yea!! I'd love to see products demo'd. I absolutely adore this brand. I've been mixing this and Osea, and I'm a huge fan. I'll put a drop or two of Beauty Elixir II in the Blemish Balm or press a little into my skin before. I think I remember seeing a video of the owner mixing all of the serums/elixirs she uses into a "micro-emulsion", and I definitely like that, too. I have been out of the Clearing Serum and Antioxidant Dee for a while, and now I want to buy them again! I especially like a couple of drops of Beauty Elixir II and Antioxidant Dew. I used to use that plus Clearing Serum in the AM and add in Moonlight Catalyst in he PM. I love Osea so much too though, so I've been playing around there. How do you balance new loves with old standbys? Especially when you try so many things? I would love to hear you speak on that, too. Great post--thank you! !